Top quality ingredients and pH balanced for optimum growing conditions. Now you can get the very best Professional results - just like growers in the horticultural trade. This compost is NOT available to consumers from garden centres and DIY outlets and is not to be confused with cheap and cheerful compost – this is a superior blend and will give perfect results – every time! Made from the highest quality ingredients where the exact formulation is trialled, tested and scientifically proven to encourage plants to grow optimally and reach their full potential. Each batch is freshly made and bursting with goodness and will provide the perfect growing medium where the roots will thrive and the plants will flourish. Available in 40 or 80 Litre bags that we will deliver to your door for the ultimate convenience! Simply the best compost available to the gardener today! This is a bespoke professional mix made to our exacting recipe from one of Europe's leading blenders. It contains 20% composted wood fibre, to open the mix up and get air in to the roots, and a precise blend of 3 different grades of peats to balance drainage and water holding. With added Lime, it is pH balanced to give the optimum growing conditions and with starter fertiliser and a wetting agent, to ensure even water distribution in pots and container, it will get your plants off to a head-start. On top of that it contains a 6 Month Controlled Release Fertiliser - meaning whatever you grow will get a slow and steady stream of nutrients for 6 Months. 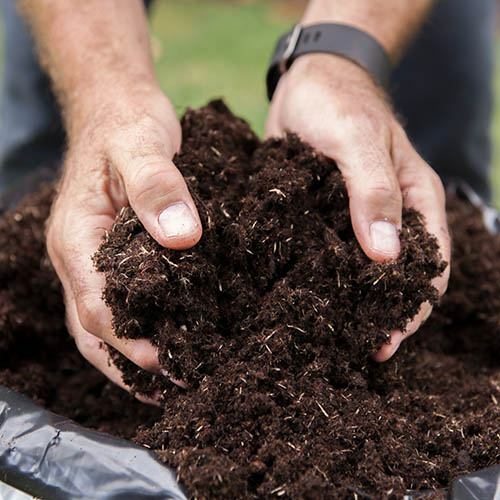 Under no circumstances should this compost be confused with cheap bags of low-grade black peats at DIY stores - you will feel the light and fluffy difference yourself, and notice the difference in plant growth quickly. Perfect for pots, baskets and planters for growing any plants. Supplied as 80 litre bags (at packing), weighing approx. 15-18kg. Blend of 20% composted wood fibre, and 3 grades of white and black peats, Lime to balance pH, plus starter base fertiliser N:P:K in balance. Also contains Wetting Agent for even water distribution and re-wetting. Please note: As this is a heavy/bulky item, each must be delivered separately by courier.